2 Pack Ruler Set. Our Ruler package is a buy 1 take 2 package. 2 Pack of Stainless Steel Rulers. Our Ruler package is a buy 1 take 2 metal rulers. An ideal office ruler pack for you and your co-workers. Buying this stainless steel ruler set is economic for groups in all sorts of settings such as schools, offices, homes, and studios. Durable and Flexible. Our metric ruler pack is rust proof and is made from stainless steel for long lasting durability and is flexible. Able to manipulate over curved surfaces without braking or damage allowing you more handling and versatility. Etched Standard and Metric Measurement Markings. This Corked back ruler has been precisely etched with standard and metric measurement markings that won't rub off over use and time. No matter the amount of use or time that goes by, our steel 24 inch rulers are ideal for any setting. 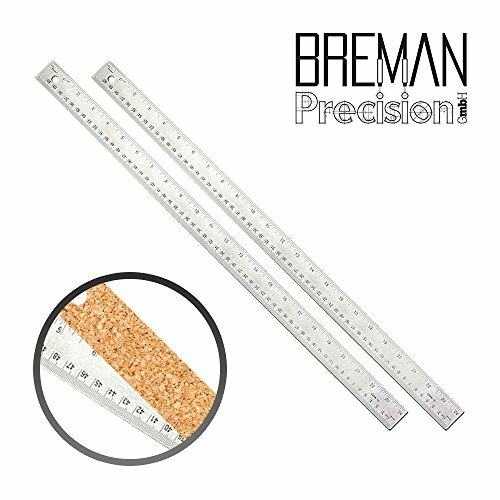 Cork Back to Prevent Slipping. . Our 24 Inch measuring rulers have a cork back feature, preventing your precision ruler from slipping while you work allowing you more efficient handling of your long metal ruler. Hang Up Hole.Our steel empire ruler has a hang up hole on its end allowing you to store your steel rulers conveniently and keep your things organized while you work and make them readily available when needed. We at National Art Supply are committed to providing quality tools and materials, helping you make your creation truly a work of art. We want you to feel just as passionate about your materials as you are about the masterpiece you are creating with them. Art is our passion, and we hope our products show it. 2 Pack of Stainless Steel Rulers. Our Ruler package is a buy 1 take 2 metal rulers. An ideal office ruler pack for you and your co-workers. Buying this stainless steel ruler set is economic for groups in all sorts of settings such as schools, offices, homes, and studios. Easy to Read and Precise Etched Standard and Metric Measurement Markings. This Corked back ruler has been precisely etched with standard and metric measurement markings that won't rub off over use and time. No matter the amount of use or time that goes by, our steel 24 inch rulers are ideal for any setting. Cork Back Rulers to Prevent Slipping. Our 24 Inch measuring rulers have a cork back feature, preventing your precision ruler from slipping while you work allowing you more efficient handling of your long metal ruler. Hang Up Hole. Our steel empire ruler has a hang up hole on its end allowing you to store your steel rulers conveniently and keep your things organized while you work and make them readily available when needed. If you have any questions about this product by Breman Precision, contact us by completing and submitting the form below. If you are looking for a specif part number, please include it with your message.